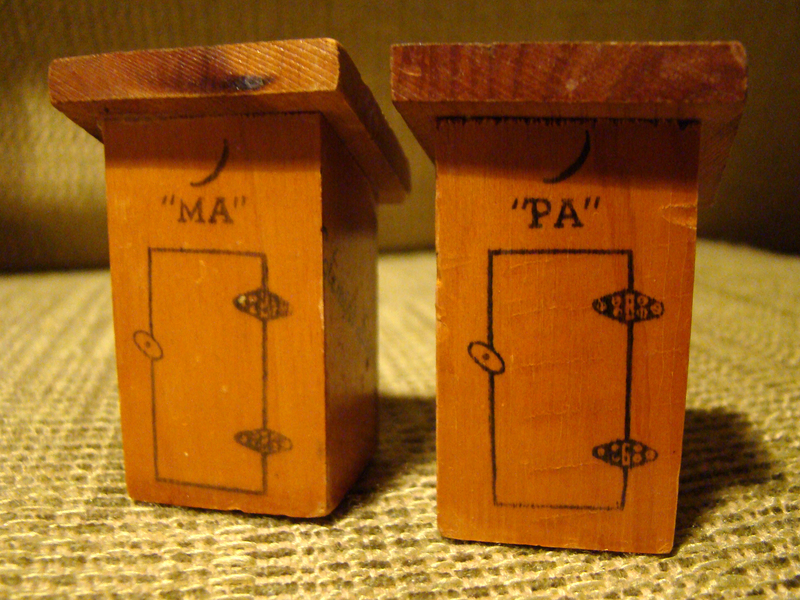 Ma and Pa's matching "outhouse" salt and pepper shakers (1 inch square, 2 inches at tallest point) from the Solemint Store, established in 1938 at Solemint Junction (the intersection of Sierra Highway and Soledad Canyon Road). Al Clark's Solemint Store carried all of the sundry and household items you'd expect an old country store to carry, as well as a host of nicknacks for tourists who stopped to gas up at the Standard station next door or grab a bite at Olive MacDougall's adjoining restaurant. The store was big on branded mementoes  from seminude pin-up calendars to funny little trinkets like this pair of wooden salt and pepper shakers in the shape of outhouses. LW2268a: 9600 dpi jpeg from digital image of objects purchased 2012 by Leon Worden, donated to SCV Historical Society.